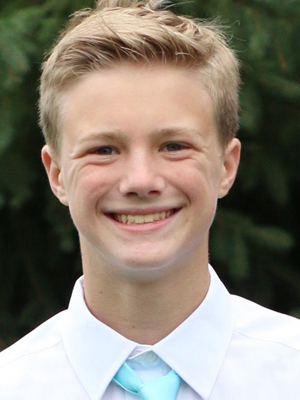 Sam Foltz, age 14 of Prior Lake, died on February 3, 2019 after suffering complications resulting from a car accident. A funeral service will be held Sunday, February 10, 2019 at 4:30PM with a visitation starting at 2:00PM all at Shepherd of the Lake Lutheran Church, Prior Lake. Pastor Dan Poffenberger will preside. Acting as pallbearers are Sam’s cousins, Easton Jacobson and Christian Urness, and his friends, Will Anderson, Tom Anderson, Ren Anderson, Ben Anderson, Ian McKowen, Jack Hulskotter, and Bruce Soukup. On May 22, 2004 in Denver, CO, parents Kari and Jason celebrated the birth of Samuel Jason Foltz, their first child. During Kari’s pregnancy, the couple chose not to know the gender. They were so excited when their little, blue-eyed baby boy was born! Sam felt a special connection to his birthplace. A proud mountain man, Sam was only two and a half years old when he put on his first set of skis. The family eventually moved to Prior Lake where Sam attended school. He excelled academically and participated in numerous activities—band, basketball, tennis, football, lacrosse, golf, and skiing. Sam enjoyed the comradery of group sports. He proudly lettered in band and Alpine skiing. Surrounded by an amazing community, Sam had the best neighbors and friends. They played tag on the beach and docks, went jet skiing, and played broom ball and hockey in the winter. Sam loved sleepovers, especially staying up late playing Xbox. Last year, Sam made the most of his boating license. Along with friends, Sam spent countless hours on Prior Lake. When Sam was three years old, he gladly welcomed a new addition to the family, his little sister Katie. The two had an unshakeable bond—they laughed, loved, fought, and forgave. Sam truly loved his family. He was especially close with his mom and trusted her opinion on just about everything. The family enjoyed traveling to Colorado, Florida, Arizona, Mexico, and throughout the Midwest. When his uncle taught him cribbage and buck euchre, Sam quickly caught on. Depending on who you talk to, Sam was the best in the family at cards. While never outspoken, Sam was humorous and easy going. He looked forward to so many things in life. Sam anticipated the independence of receiving his driver’s license and getting a summer job. Along with his father, Sam wanted to travel to the Boundary Waters. Sam was an amazing son, big brother, friend, and all-around genuine person. His kindness and generosity extends beyond his own life through organ donation. His donation provides renewed hope and life for others. Sam gave one of the most precious gifts possible—the gift of life itself. Sam is forever loved and missed by his parents, Kari and Jason Foltz; sister, Katie Foltz; maternal grandparents, Bob “Papa” and Sue “Nana” Urness and paternal grandmother, Jeanette Foltz; uncles, Scott (Diana) Urness, Tim (Carrie) Urness; aunt, Deana (Glen) Zemke; his beloved dog, Kallie, and countless cousins, other relatives, friends and neighbors. Sam is greeted in Heaven by his grandfather, David Foltz. In lieu of flowers a memorial fund will be set up in Sam’s honor. Arrangements with Ballard-Sunder Funeral & Cremation, Prior Lake Chapel. The gift of a child is the greatest gift we receive. To have that taken away so unexpectedly is unimaginable. I will hold Sam in my heart with the both of you, as well as Katie. Your entire family is a shining light each and every time I see you. Keep the light shining. Sam will be missed but never forgotten. Love you all. I cannot imagine what it would feel like to lose my brother. I am sorry you have to experience this loss much sooner than anyone could imagine. It is just not fair. I remember your smile and genuine kindness towards all. You are a beautiful person and I wish you the grandest rainbow at the end of this rainstorm. My daughter attends Prior Lake high school where she is a sophomore and plays in the band. I don’t know how well she knew him but they’re all apart of the band family and it’s a great loss. May God Bless you and your family during this time and give you strength and comfort now and forever. Our most sincere sympathies are being sent to each one of you. You have been in our thoughts and prayers and conversations regarding the beautiful gift of life through such tragedy. We talked about when Sam was born and the excitement of a baby in the family again. It sounds like he was a fine young man, which is exactly what we would expect from your family. It was heartbreaking to hear of your loss. From my family to yours we are very sorry. You have a wonderful Angel in heaven watching over all of you. Healing prayers to you during this extremely difficult times. We love you all so much. You are in our hearts. My son was in Band with Sam and is devastated by the loss of his bandmate and friend. Words fall short of expressing my sorrow for your loss. I am deeply sorry to hear about the passing of Sam. Wishing you peace to bring comfort and the courage to face the days ahead and loving memories to forever hold in your hearts. May you find comfort in the love of friends and family as you remember your amazing son and brother, Sam. A child is a beautiful gift. Keeping you in our hearts and prayers. My heart is broken for you. I don’t even know Jason and Katie, but I cannot imagine what you are going through. If there is anything I can do, please reach out. For now, my prayers are with all of you. Kari, I look forward to seeing your sweet, smiling face soon. We are deeply saddened by your loss. Our hearts ache for you and your family. Our prayers and blessings are with you. Kari words cannot express the sorrow and heartache I and all at Waconia enrichment center feel for you and your family. I cannot imagine your heartbreak and you and your selfless giving to allow other people to live through your son. May God abide with you and your beautiful family to help you through this tragedy. We have all been saying so many prayers for you. With love and sorrow for you. If you need anything, we are here. My heart aches for all of you. My deepest sympathies. May you be comforted by the love of those that surround you in your grief. Many prayers, in sighs too deep for words, for all that is needed in each moment. My heart is broken for you. There are no words to make this better. There is no loss greater than that of a beloved child. I am holding you all close in my heart and am so sad that I won’t be able to be there on Sunday to celebrate and grieve with you. We are out of town. I will be at work when you return, ready to hug you and do whatever I walk this journey with you. You have the support of all of your colleagues at Arcadia. Sending love, hugs and healing wishes for all of you. We are so sorry for your loss and are praying for you. Words can’t express the sadness we feel and hope as time passes you can eventually overcome some of your pain. Wishing you peace to bring comfort, courage to face the days ahead and loving memories of Sam to forever hold in your heart. Our deepest condolences go out to all of you. We cannot image what you are going through but please know that we are holding you close to our hearts and in our daily prayers. There are no words. Just know that love and prayers are being sent your way. It is clear what an amazing and talented young man Sam is was! I am deeply sorry for your loss. We are so sorry for your loss. Words can not express the sadness. I got to know Sam through coaching him in PLAY football and he was a great kid. Always a great attitude and fun kid. Kari, I remember you coming up to me after a game when Sam ran for a TD that game and you were such a proud Mom! You guys are in our thoughts and prayers during this unbelievably difficult time. To all of the Urness family. I write this with tears in my eyes. How devastating to lose a young child. There are no words. Know that our hearts ache with you. Peace and courage be with you all. God’s blessings. I cannot begin to fathom the pain your are feeling. I am amazed at the strength you have shown in the midst of this tragedy, and the gift of life you have bestowed on others. My heart aches for you, You all are in my prayers. Jeff and I only met Jason recently about a project for our home. We were both so very sorry to hear about Sam. Having a 14 year old ourselves, it’s hard to imagine what you must be going through. God bless you and your family. We are praying for your strength and peace. I think of your heartbreak and generous spirit daily. Sam was an amazing young man. I pray for your strength and courage moving forward with this loss.